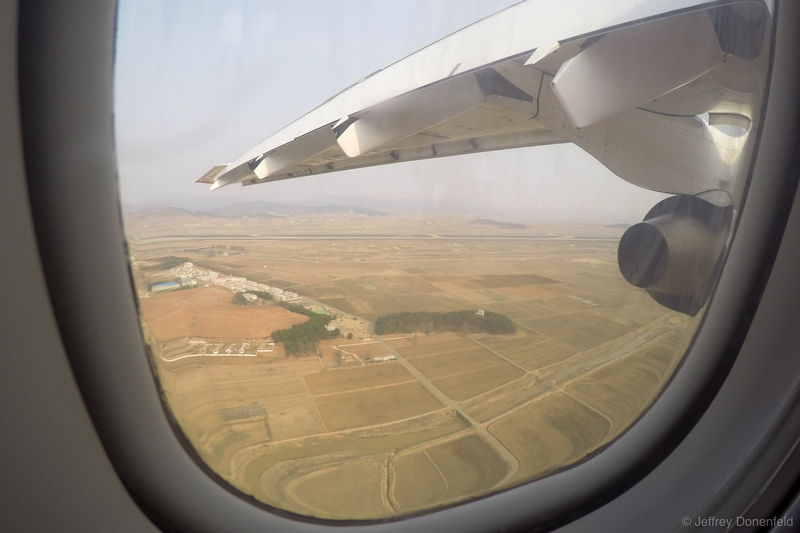 Getting ready to land in North Korea. The difference between the outskirts of Beijing and Pyongyang are stark. There are essentially no suburbs or sprawl of Pyongyang - it simple stops and gives way to open land. There are a couple of housing blocks, but almost no cars can be seen, nor can any real activity on the ground. Getting ready to land in North Korea. The difference between the outskirts of Beijing and Pyongyang are stark. There are essentially no suburbs or sprawl of Pyongyang – it simple stops and gives way to open land. There are a couple of housing blocks, but almost no cars can be seen, nor can any real activity on the ground.